Fans of the old, all-female Azami Sushi on Melrose were devastated when Chef/Owner Niki Nakayama shut down shop back in 2008. They can take solace in the fact that Nakayama is currently cooking at Inaka in Arcadia, but just temporarily. 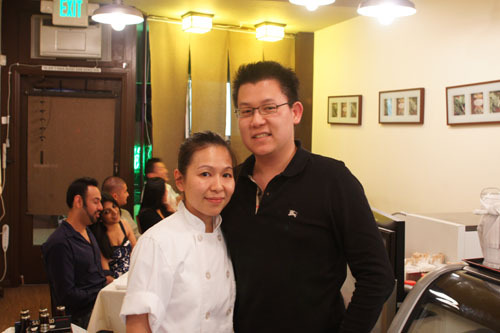 A loyal kevinEats reader, Jai, stopped by for lunch back in April and struck up a conversation with Chef Nakayama. Impressed by her palpable passion for food, he knew that he had to make a reservation for Inaka's Chef's Table. I was invited, of course, as was Ryan of Epicuryan, who, coincidentally, happens to be a classmate of Jai's at UCLA (small world, eh?). 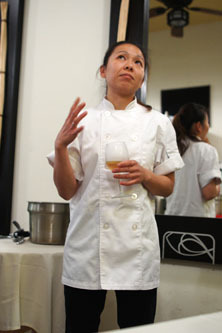 A bit about the Chef: Nakayama attended Pasadena's California School of Culinary Arts before embarking on a culinary tour of Japan, where she apprenticed at a ryokan owned by her aunt and uncle. 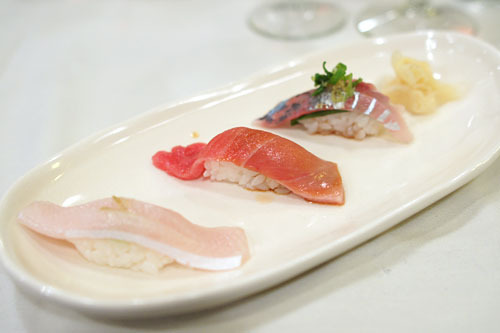 When she returned, Nakayama worked under Morihiro Onodera (of Mori Sushi) at the legendary Takao in Brentwood. Then, in 2000, the Chef teamed with cousin Sayori Onozuka to open Azami, which became a local hotspot thanks to Nakayama's top notch sushi (her parents, apparently, are fishmongers) and reasonably-priced omakase dinners. However, Onozuka eventually moved back to Japan, and though Nakayama held the line for a while afterwards, she eventually decided to sell the business in July 2008. The restaurant continued to operate for some time under the Azami banner, but later changed its name to Kazuyo. Left without a restaurant, Nakayama turned to Inaka, her sister's small Japanese café in Arcadia. 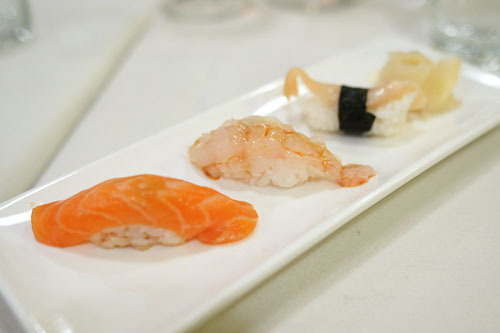 Inaka normally serves sundry items such as chirashi bowls, tempura, salads, and the like, but in September 2008, the Chef began offering her $80, eight-course, reservations-only, BYOB omakase dinners in the space, and that's exactly what we were here for. The space is tiny, seating about 14 diners at most. The display cases hold some prepared items, while a decently-sized kitchen (staffed by three) is in the back. 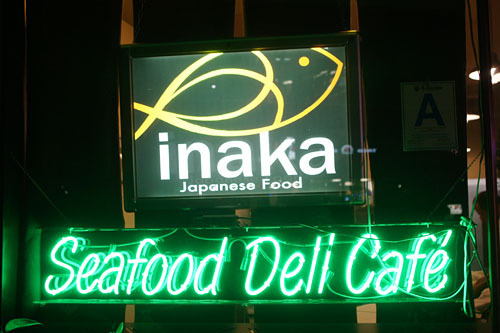 Inaka is a strictly bring-your-own affair, and we definitely brought our own. Actually, Jai ended up providing most of the libations (something about needing to clean out his cellar), and we were thankful for it. 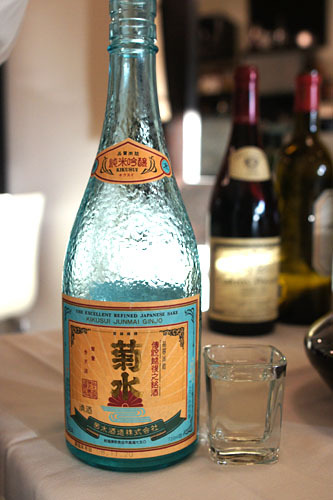 Jai, however, didn't bring the Kikusui Junmai Ginjo, an easy-drinking, fruity, spicy, slightly hot-on-the-finish sake from Niigata. 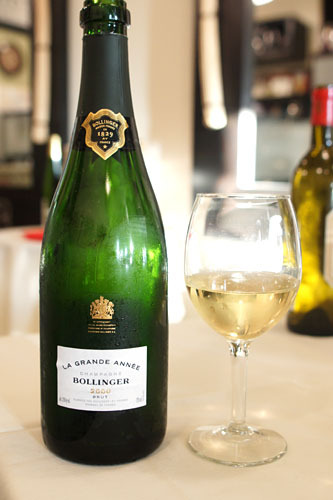 Nor did he provide the 2000 Bollinger La Grande Année Champagne. Ryan and I brought this bottle, which astute readers may remember from a recent dinner at The Dining Room. This was a creamy, citrus-y, honeyed sparkler, with a bit of yeastiness on the attack. As delicious as it was, the Bollinger would probably be even better with a few more years in the bottle. 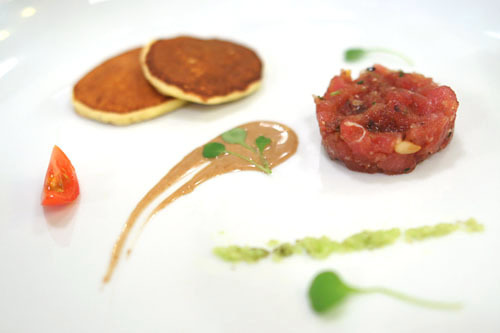 Tuna tartar has been done to death, but Nakayama's version here does stand out from the crowd. With the tuna, she mixes in Niçoise olives, pine nuts, olive oil, and garlic, and serves the amalgam with Japanese wasabi, anchovy paste, and potato-Parmesan blinis. I loved the flavor imparted by the pine nuts, and how it played so well with the weightiness of olive oil. The anchovy, meanwhile, further heightened the power of the dish, and I was fascinated by the tempering effect of the blinis. 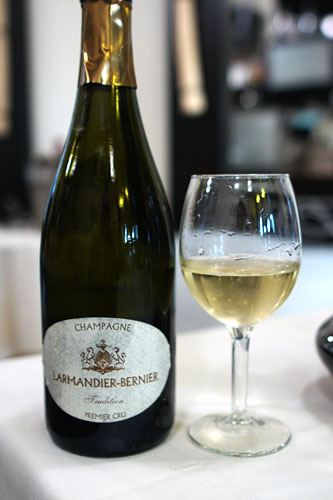 Jai brought two Larmandier-Bernier Champagnes for us to compare and contrast, the first of which was the non-vintage Tradition Brut 1er Cru. This was a toasty, dry, classically-structured Champagne with pleasant acidity and a light minerality. Nice. Jumbo sea scallops from Japan were accompanied by a disc of kombu jelly, uni butter, a microgreen salad, and yuzu zest. Taken alone, the hotate were suitably soft, supple, and sweet, with a markedly briny finish to boot. I liked how the uni added further richness and depth to the scallops, accentuating the bivalves' natural sapor, while the microgreens and yuzu contributed a piquant counterpoint. 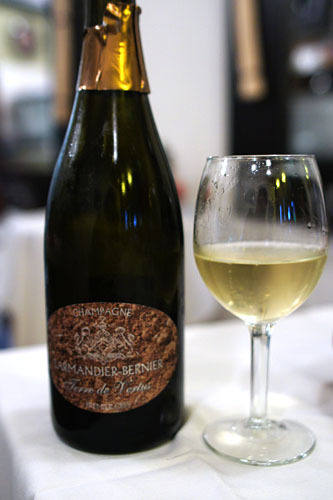 The other bubbly from Larmandier-Bernier, the Terre de Vertus 1er Cru Brut, was a totally different beast. A no dosage blanc de blancs of 100% Chardonnay, it was probably the driest Champagne I'd ever had, and was austere, even off-putting at first. It mellowed out with some time in the glass fortunately, and eventually demonstrated very concentrated, very complex notes of minerals, earth, toast, and apple. 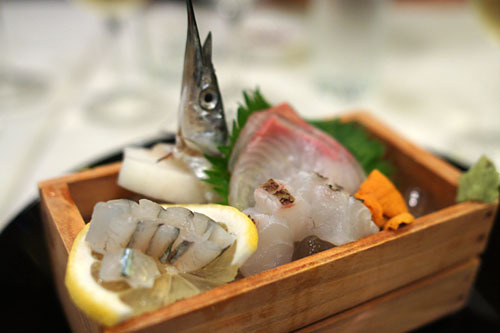 Sashimi came in four varieties: a subtle sayori (needlefish) with superb lemon tang; a surprisingly creamy tai (sea bream) with a great lingering savoriness; a sweet, briny kanpachi (amberjack) from Japan; and Santa Barbara uni (sea urchin roe). Humorously, we were instructed to avoid eating the fish head--which came from our sayori--for fear of a puncture wound. When this dish arrived at the table, I was instantly reminded of Urasawa's utterly transcendent kani miso korayaki, which I will posit as one of the best things I've ever eaten. Nakayama's version doesn't reach such lofty heights, but was an accomplishment in its own right. The Chef loads up a crab shell with shiitake, egg, crabmeat, and both black and white truffle. 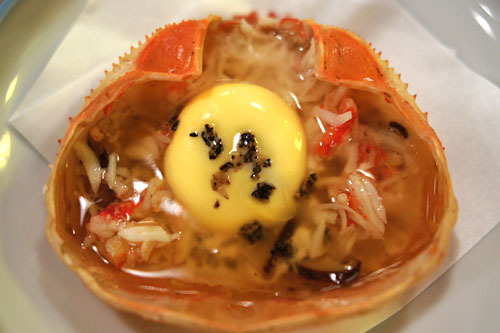 I positively adored how the essence of crab was so forcefully delivered to my palate, and how the "eye" of egg yolk, once pierced, enveloped the dish with its overarching creaminess. The shiitake, meanwhile, provided an earthy tinge to things, and of course the truffles made themselves known as well! I even made sure to drink up the buttery "juice" left in the shell. Fantastic. 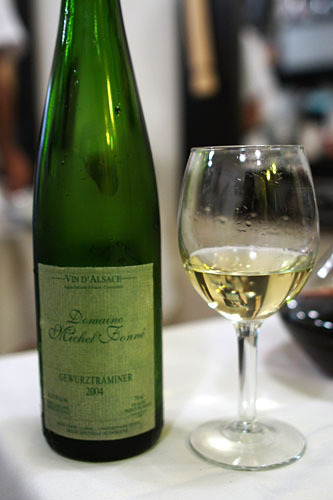 Our next tipple was the 2004 Domaine Michel Fonne Gewurztraminer from Alsace. This was a surprisingly weighty, viscous wine with powerful notes of lychee, spice, and minerals. The rice itself, imbued with the flavor of unagi and gobo (burdock), was quite tasty on its own, with a subtle sweetness that I enjoyed. The foie gras, on the other hand, was light, focused in flavor, and nicely moderated by the rice. It was now time to bring forth the reds. 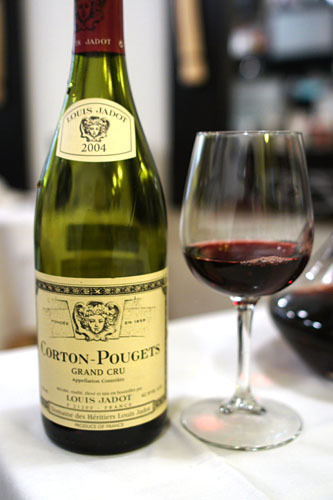 We started with a Burgundy, the 2004 Louis Jadot Corton-Pougets, which I found pleasingly tannic, lightly smoky, subtly spicy, and loaded with juicy dark berry notes. Quite nice. 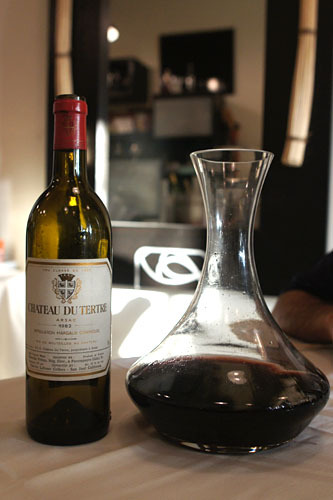 We also had the 1982 Château du Tertre, which Jai had been decanting ever since the start of the meal. A Bordeaux from Margaux, this was clearly a full mature wine, with soft, delicate tannins and smooth, silky hints of dried fruit, earth, and leather. It'd be a great Totoraku wine. 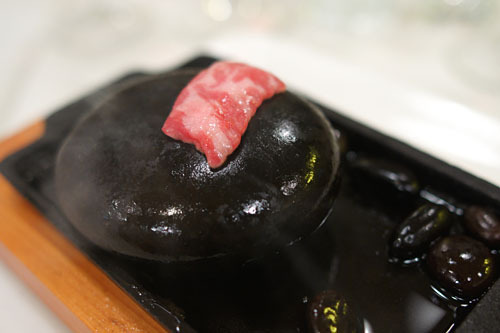 Ishiyaki refers to a cooking method employing hot stones. We were instructed to coat the stone with the cubes of butter (which Jai comically mistook for tofu!) 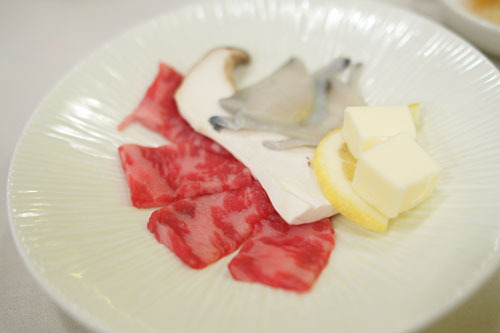 prior to laying on our slices of A5 wagyu beef, which, expectedly, were fatty, oily, and positively luscious. As tasty as the beef was alone, I enjoyed the meat even more when dipped in the paired sesame oil-lemon-pepper sauce. The awabi (abalone), on the other hand, was meant to be eaten raw. I found the gastropod crisp in texture but quite mild in brine, so the include soy-wasabi sauce was a fitting accoutrement. Hamachi Belly - I loved the piquant tang of yuzu kosho here, and how it balanced the considerable heft of the yellowtail belly. Toro - This was probably one of the most ridiculously tender pieces of toro I've had. It broke apart instantly upon mastication and coated my palate with plenty of that signature tuna belly lavishness. 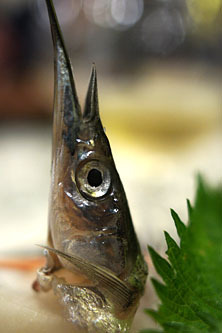 Aji - Mackerel from Japan. I really appreciated the use of scallion and shiso here, and how the vegetables worked perfectly in moderating the mackerel's inherent brine. Sake - Salmon from Scotland--lean, smooth, and very refined. Amaebi - Very nice snappiness on the sweet shrimp, perked up by a small amount of soy sauce. Aoyagi - One of the best preparations of aoyagi (orange clam) that I've had in a while; I thoroughly enjoyed its initial sweetness and lingering seaweed-tinged finish. 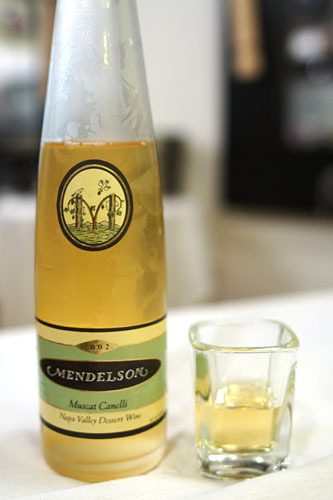 With dessert, Jai served up the 2002 Mendelson Muscat Canelli from Mendocino County, CA, the only non-French wine of the night. 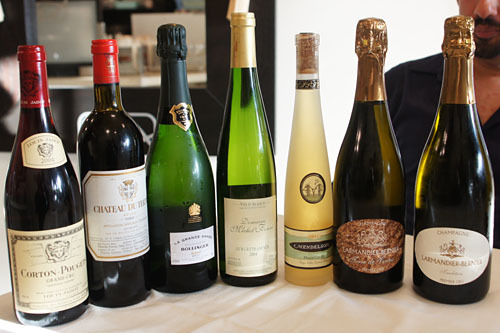 It showed a lush, heady bouquet with juicy melon and tropical fruit undertones and a pronounced floral character. Nice! Dessert came in two parts. 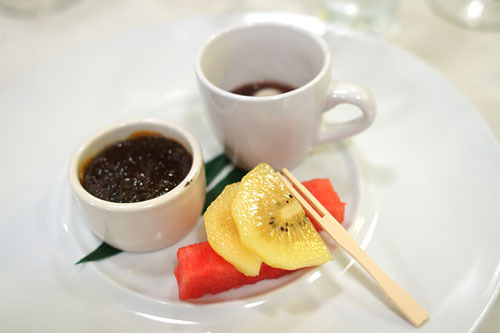 The first was a sesame seed crème brûlée, a gritty custard positively imbued with the quintessence of sesame. Next up was the mochi. The unabashed sugariness of the red beans formed a fitting complement to the comparatively mild globules of glutinous rice. After the meal, Nakayama came out to chat with us and share a glass of Champagne. Some commentators have described Inaka's Chef's Table as a sort of budget Urasawa. Clearly, at less than one-fourth the cost, Inaka isn't at that level, but I didn't expect it to be. What I did expect was a seasonal omakase experience using high quality ingredients prepared with a touch of international flair, and in that front, Nakayama delivered. In November, she's planning to open a restaurant on the West Side, near the intersection of Overland and Palms. It'll likely be an omakase-only affair, and she'll be offering both traditional and modern versions of kaiseki. A small four-seater sushi bar should also be in place. I'll be looking forward to it! Looks good. I should give it a try before she moves to the westside. Any ideas if the chef changes up her menu? Wow, this restaurant is right in my backyard and somehow I've never seen it before. Thanks for the review. Hopefully I can try it before Niki leaves! I think its unfair to the chef for people to be making such immediate Urasawa comparisons. Any true artisan spends more time developing their own vision and craft with the resources and experiences they have been able to accumilate. It's kind of like comparing every french restaurant in this country to Daniel Boulud. Inaka is definitely a gem of a resto and like ConBon, I hope to go back at least once before she moves out West. And I agree with anon that it's unfair to compare Inaka (or any other restaurant's omakase) to Urasawa. Different chefs have different visions, interpretations and influences, even when they are representing a regionally-specific cuisine. And of course, it's really apples and oranges when doing comparisons of such different price points due to the quality of ingredients, time/energy spent and size of staff that a chef can invest in. So personally, when people ask me for omakase recommendations, I'll definitely reply based on what they are willing to spend. If money's no object, Urasawa of course -- if their price limits is more along $100/person, then I'll definitely point them to Inaka. Kevin thanks for posting this so quickly! It was a great dinner and great to meet you! I can't wait to see pictures from the J. Fox dinner. Danny: She does, but I believe it's more of a seasonal thing. PS: Where are you living now? Definitely let us know how it turns out if you do go. Anon: Indeed. I don't think they meant it as a true apples-to-apples comparison; it was more in reference to the general style and progression of courses. Komie: Great to meet you too--you should go out with Jai more often! Great review, Kevin. This will definitely be on my list of stops if I make it out to this part of Cali. For sure, I will have to work on that. Let me know when you boys wanna do chaat/South Indian. Komie: Where are the good chaat places in SoCal? I'd really like something like Vik's. Kevin where have you tried? Shot me an email, there are some good ones in your neighborhood. Ok how about you promise to at least let me feed you good gujurati food before you resort to going there? Ok deal. I'll let you know when I move up! Thanks for the great description and photos! I'd really like to try this out. How much was the omakase? Thanks for the update. Any idea what prompted the sale? According to reviews on Yelp, the place is still open.